iTraceYou.com, an effective and advanced email tracing/tracking service, was born out of my personal need to identify whether some people were really reading my emails or not. Along with my long-time friend Marcos Machado, we developed the system from the ground up in Perl and used a MySQL database. iTraceYou had more than 33,000 users from 67 different countries, and was used to trace over 350,000 messages. Those were big numbers back then. To try to commercially develop the opportunity, we created OpenTrace Technologies. We also launched a service named Confirmando targeting the Portuguese market niche, as we explored ways to expand the business. Media outlets (small sample listed above) from all continents promoted the iTraceYou.com service. That included TV news, and radio interviews. Many articles were also published in web sites, newspapers, and magazines. People from many countries learned about the service because of all the attention we got from the media - articles were published in the United States, Brazil, Poland, Switzerland, Singapore, Japan, Germany, Norway, Mexico, Argentina, Canada, Colombia, Italia, etc...). No money was ever spent in marketing or ads. 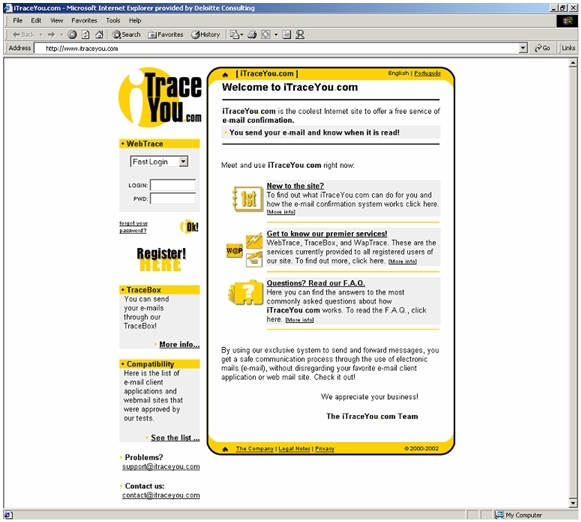 This document contains the original application for the non-provisional patent that was filled for the iTraceYou.com service. It describes a method for tagging and tracing email messages so delivery confirmation can be obtained.